Finding the right vlogging camera for your child can be very difficult depending on how old they are. But one thing is for sure, many children aspire to be like their favorite vloggers when they get older and can’t wait to start vlogging themselves. 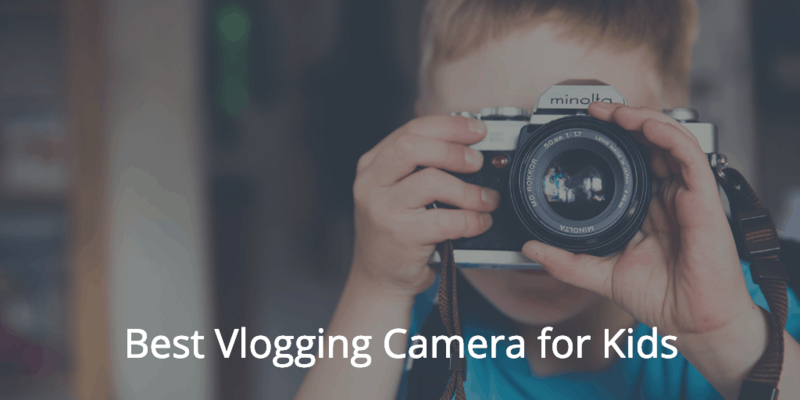 To help you find the best vlogging camera for your child we created this guide. Let’s start with how to find the best video camera and then highlight our favorite cameras. Age: One of the most important aspects to consider is the age of your child. A 4 year old child will handle the video camera very different from a 9 year old. Therefore we have split our video camera recommendations in two categories: age 3+ and age 9+. These categories are only a suggestion, your 7 or 8 year old child might be able to handle a more advanced camera. It’s best to use your own judgment in this case. Feel free to check our best vlogging camera guide if you are confident your child can use a regular camera. Durability: Somehow children always seem to be able to break, drop or lose even the toughest toys. The cameras in this guide, especially those for 3-9 years old children, are not very fragile and are able to withstand the abuse of children. Price: Children don’t need the most expensive camera with advanced features and you don’t want to constantly supervise your child(ren) while using the video camera to make sure it’s handled correctly. That’s why all video cameras in this guide are very affordable. Easy to use: A child should be able to use the video camera by himself without having anyone constantly guiding them. All of the cameras featured in this guide are easy to use for any child. Type of camera: Which type of camera you should pick for your child depends on how your child will use it. If your child only wants to record video a camcorder might be the best option. If your child wants to use it in or around water or while skateboarding or biking an action camera will be better suited. Video Quality: Of course the video quality of the camera should also be good so your child can create good quality videos. There is a good chance you will watch some of the videos your child has created in the future and that’s a lot more fun if the quality of the video is good. 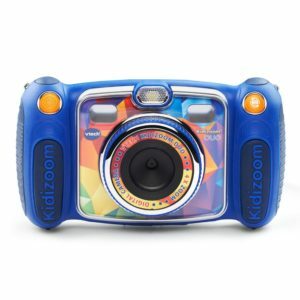 Our first recommendation is the VTech Kidizoom DUO Camera. The Kidizoom DUO has two cameras, one on the front and one on the back, with a dedicated switch button. This is great for taking normal pictures and taking selfies. It also has 4x digital zoom and built-in auto flash so your child can use it for longer distances and in the dark. The Kidizoom DUO features a 2.4-inch TFT color screen. The screen can be used to view pictures and video taken with the camera but also features 5 built-in games. You can limit the play time or disable the games completely using the parental control settings. The camera has 256MB memory built-in but it’s expendable up to 32GB with a microSD/microSDHC card (sold separately). The camera uses 4 AA batteries but knowing how easily kids can be distracted it will shut off after 3 minutes without operation to conserve battery life. 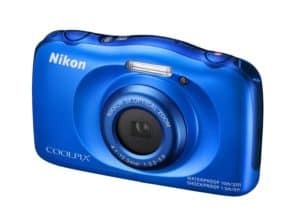 Our first recommendation for children 9 years and older is the Nikon COOLPIX W100. With this camera being shockproof up to 5.9 feet, waterproof up to 33 feet deep and freeze proof down to 14° F (-10° C) it is built to last! The oversized buttons and easy menus make it incredibly easy-to-use and perfect for children to start recording videos. The 13.2 megapixel low-light CMOS sensor can take high quality pictures and record Full HD 1080p videos with stereo sound. Pictures and videos can be viewed on the 2.7-inch LCD screen on which you can also select fun effect like Miniature to make an entire scene look like a toy model. The battery of the COOLPIX W100 is rechargeable so you don’t have the hassle of switching out AA batteries. Our second age 9+ recommendation is the Panasonic HC-V180K. This camcorder is the most expensive camera in this guide and is a lot more advanced. That’s why we only recommend this camcorder if your child is serious about creating videos. 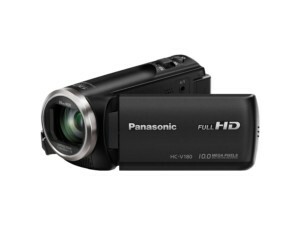 This Panasonic creates Full HD 1080p videos and uses an image stabilizer to reduce camera shake. The wide-angle lens can capture the entire scene in tight places and can zoom in up to 50 times with optical zoom. The battery life of this camcorder is great and you can expand the storage space with an SD card up to 64GB. Our first action camera recommendation is the VTech Kidizoom Action Cam. This action camera has a camera that can be flipped 180 degrees so you can take regular videos but also selfies and vlogs. It’s durable and waterproof so it’s excellent for younger children but can be used up to 12 years old. The camera comes with two mounts for mounting the camera on a bike, skateboard, helmet or anything else. 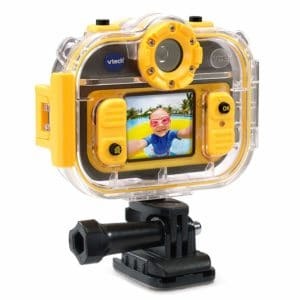 The waterproof housing is waterproof up to 6 feet deep so you can take pictures and record video underwater. This action cam features a 1.4-inch LCD color screen on which you can preview photos and videos, play games or apply effects, frames and filters. You can also select different modes using the camera screen so you can create time-lapse photos or stop-motion videos. The camera has a MicroSD card slot so you can expend the memory storage for longer videos. Note that a MicroSD card is not included by default! 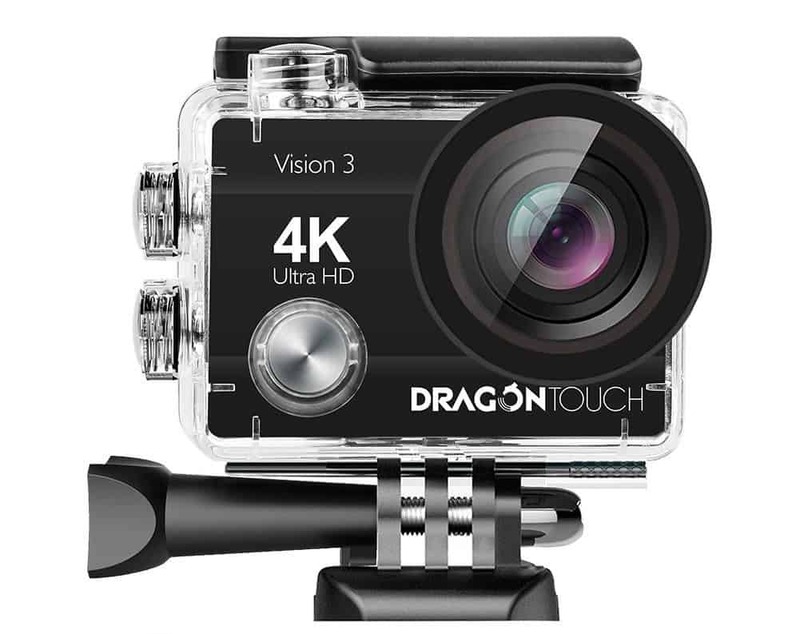 Our second action camera recommendation is the Dragon Touch 4K Action Camera. This camera is more powerful and advanced and is more suited for children age 9 and up. This action camera records in 4K Ultra HD at 30 frames per second (fps) or Full HD 1080p at 30fps. It also features a 2-inch HD screen on which you can set up, preview and playback video. The waterproof case is durable and is waterproof up to 30 meters so you can use it for snorkeling and diving. The case comes with multiple mounting accessories so you can always find the perfect mount for every activity. The camera comes with two rechargeable 1050mAh batteries that last up to 90 minutes each. We recommend adding a 64GB SD card to your order as there is no SD included. Finding the perfect vlogging camera for your kids can be difficult depending on how old they are! Hopefully this guide was able to help you make the right decision so your child can chase their dreams of becoming the next big vlogger.